“Poor Chicago,” a friend of mine recently said. Given the number of urban apocalypses here, I couldn’t tell which problem she was referring to. Was it the Cubs never winning? The abominable weather? Meter parking costing more than anywhere else in America — up to $6.50 an hour — with the money flowing to a private company, thanks to the ex-mayor Richard M. Daley’s shortsighted 2008 deal? Or was it the fact that in 2012, of the largest American cities, Chicago had the second-highest murder rate and the ­second-highest combined sales tax, as well as the ninth-highest metro foreclosure rate in the country? That it’s the third-most racially segregated city and is located in the state with the most underfunded public-employee pension debt? Was my friend talking about how a real estate investor bought The Chicago Tribune and drove it into bankruptcy? Or how 15-year-old Hadiya Pendleton, who performed at Barack Obama’s inauguration, was shot dead near the president’s Kenwood home?" Illustrating the rule that criticizing Chicago is something that is Simply Not Done, this piece sent locals into collective apoplexy. Huffington Post Chicago provides a roundup of the “epic backlash.” The Atlantic Cities chimes in with its own roundup of “Everything You Need to Know About Why Chicago Is Furious With Rachel Shteir and The New York Times,” noting that “We don't have to wait for the angry letters to be printed in the next Book Review. The counter-manifestos are already here! In the past few days, it seems, everyone from Gary to Milwaukee has read Shteir's ‘Chicago Manuals’ piece, resulting in a groundswell of angry rebuttals.” An army of angry tweeters spoke out. And even the mayor addressed the issue. Not a bad day’s work for a theater professor at Depaul (Shteir’s day job). In a sense Shteir is right. I’ve long noticed that Chicago is basically an echo chamber of boosterism in which everyone is terrorized about deviating from the party line lest they be excommunicated from polite company, a fate that may well indeed await Shteir. And Chicago clearly has manifest problems as a city, many of which she notes, though many of her list such as the perennial disappointment of Cubs fans are clearly more snark than substance. However, what Shteir and Chicago both miss is the real value proposition of the city. Taken on its own terms, Chicago is a simply fantastic place to live. It has a magnificent lakefront setting, a stunning skyline, fantastic cultural institutions, incredible opportunities to consume (from designer clothing to world class dining), and much more. It may be true that these great things largely benefit those from more affluent precincts with vast tracts of the city left behind in segregated, entrenched poverty, but it’s tough to name a place where that isn’t likewise true. Much of Brooklyn, for example, remains mired in poverty, but no one in New York seems to care and criticisms of it as such are simply shrugged off. Chicago also has perhaps – at least in my view – the best blend of the best of the elite urban center with much of the best of cities further down the food chain. You can have genuinely walkable neighborhoods, take transit to work, and eat food that would be impressive in any city in the world while simultaneously having a spacious and affordable condo with parking that allows you to drive to a conveniently located Target or Costco to stock up when you need to. It’s car oriented when you need it and walkable when you need it, all at a reasonable price. Now that’s certainly something that many cities lower down in the hierarchy will also claim – big city amenities with a high quality of life. But Chicago is the most elite city in America that can plausibly make that claim. What Chicago is not, despite its pretensions, a truly global tier one city like New York, London, or Paris. That is what the booster culture can’t abide. It is an article of faith that every Chicagoan must believe, or at least pretend to believe, that Chicago is worthy of being spoken of in the same breath as any city in the world. Even a critic like Shteir seems to evaluate it on that basis. But the reality is that Chicago is a “1B” city like Frankfurt or Toronto not a “1A” city. There’s nothing wrong with that. In fact, I happen to believe Chicago’s value proposition is arguably better than most of the 1A cities for everyone who isn’t in the 0.1%. But both local boosters and critics can’t look at Chicago for what it is, but rather what it isn’t and never will be. Chicago will never be New York. But neither will New York ever match the best of Chicago on the Windy City’s own terms with a comparable quality/price/ease mix. 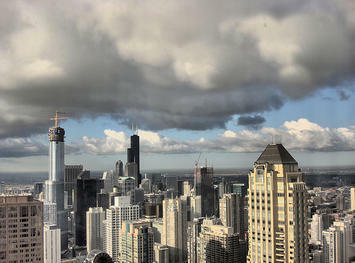 In this sense, Chicago might be seen as the leader of a wave of other emerging would be 1A cities – Houston, Dallas, San Diego – that are making the cut from a second tier city. Being the leader and something of a role model for a wave of rising cities may not be bad positioning at all. Submitted by Kamran123 on Thu, 04/16/2015 - 06:31. Submitted by Kamran123 on Sat, 04/11/2015 - 07:47. Submitted by Kamran123 on Sat, 04/11/2015 - 05:34. Submitted by Kamran123 on Sat, 04/11/2015 - 05:31. Submitted by mikello85 on Wed, 05/27/2015 - 06:30. Submitted by Kamran123 on Fri, 04/10/2015 - 06:04. Submitted by Kamran123 on Thu, 04/09/2015 - 01:09. Submitted by Kamran123 on Sun, 04/05/2015 - 07:35. Submitted by Kamran123 on Thu, 03/19/2015 - 00:35. Submitted by Alloss on Wed, 03/18/2015 - 10:45. I will right away clutch your rss feed as I can not find your e-mail subscription link or newsletter service. Do you’ve any?